Today, the Franklin Founding Father Commemorative Silver Dollar Coin remembers when he along with two grandsons stealthily set sail for France 241 years ago. On September 26, 1776, Franklin, Silas Deane, and Arthur Lee were elected by Congress as commissioners to make a treaty of alliance with France, and to represent the United States at the French court. At the age of seventy, on October 27, 1776, Franklin again braves the Atlantic and sets sail for France in the American frigate Reprisal, commanded by Captain Wickes. The English cruisers did indeed pursue the Reprisal, and the crew of the American vessel was several times beat to quarters, but the Reprisal was not overhauled, and after a short but rough voyage the vessel anchored in Quiberon Bay, in Brittany, and Franklin arrived in Paris on December 21, 1776. During the period prior to the recognition of the United States as a nation, Franklin lived quietly at Passy, then a suburb of Paris, with his grandsons, William Temple Franklin, and Benjamin Franklin Bache. His duties required much tact and skill, for at first the French king, Louis XVI, and his minister, Count de Vergennes, preserved outwardly the state of neutrality between England and France; but Franklin was able to secure loans for Congress from bankers in Paris amounting to 3,000,000 livres, and the French ports were open to American privateers. The French minister sometimes ordered the American cruisers to leave French ports with their prizes within twenty four hours, but these orders were not enforced, and many violations of the laws of neutrality were winked at. While the diplomatic life was quiet, and Franklin was careful not to give offence to the French Government, he became the idol of the French people. He was universally admired and féted. With the enthusiastic temper of the French, it was no wonder that Franklin became the rage of Paris. He was not a mere passing fancy—-he had touched the heart and life of the people by his familiar writings; he was a philosopher and a great man, and the French made him a hero. Charles Sumner, in a learned and striking article in the Atlantic Monthly (“Monograph from an Old Note Book,” November, 1863), gave the origin and history of the celebrated inscription to Franklin’s portrait: Eripuit cœlo fulmen, sceptrumque tyrannis (He snatched the lightning from heaven and the sceptre from tyrants). It was composed by Turgot and appears in the above form in his published works. It was not strange that France should have honored the Apostle of Liberty. 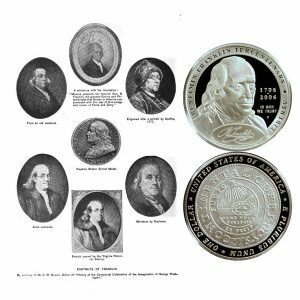 The Franklin Founding Father Commemorative Silver Dollar Coin shows with several images of the man including one with his fur hat.